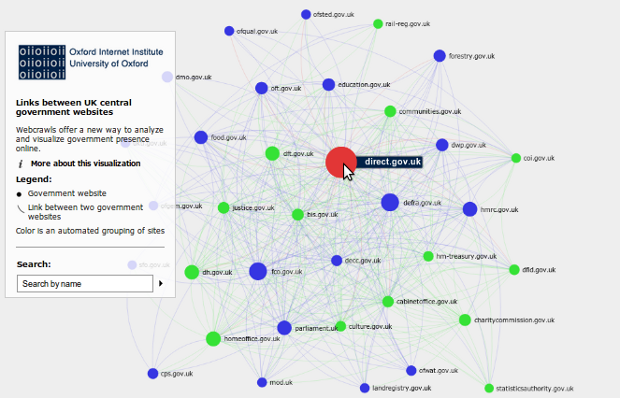 We have collected and visualized a pilot crawl of UK Central Government websites in late 2011, showing all hyperlinks between central departments and the size of departmental web sites. This work was funded by the ESRC Internet, Public Policy and Political Science project and the JISC-funded InteractiveVis project. The UK government digital landscape is set for some major changes with the replacement of the direct.gov portal with the new gov.uk portal — it will be interesting to see the difference in network configuration when we carry out the crawl again later this year. Note: This post was originally published on the Government on the Web project website on 23 October 2012 9:15 am . It might have been updated since then in its original location. The post gives the views of the author(s), and not necessarily the position of the Oxford Internet Institute.